Lobee Liquid Ring Pumps are ideal for many applications not practical for other pumps. They will pump small capacities at high heads and self prime up to 28 foot maximum suction lift (sea level) producing its rated capacity despite air pockets or siphons in the suction line. Pumps water, air, vapor or any combination of each without hammering or pounding. Simple in construction, only one moving part, and foolproof in operation. It requires no priming chamber, no foot or check valves, no springs, pistons or gears. Complete axial and radial balance of impeller reduces bearing loads to a minimum. 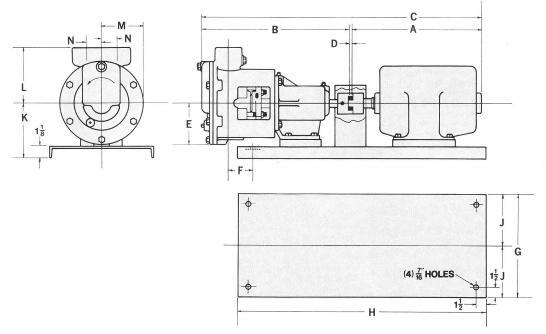 Impeller is keyed to shaft but is free to float axially and center itself in the casing, maintaining liquid films between its faces and the casing walls requiring no need for adjusting the clearance. 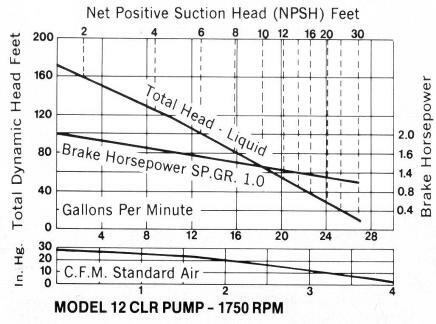 The liquid being pumped acts as a piston in the pump. Without metal-to-metal contact, there is little wear or maintenance. In addition, application performance can be greatly enhanced by using a Variable Frequency Drive (motor inverter) on the Model CHLR 3600 RPM Liquid Ring Pumps. All motors have a 10:1 turndown ratio which will enable a fully adjustable flow and pressure (head) range that takes full advantage of the New CHLR’s capabilities. A single pump can be used for many pumping tasks, reducing costs and providing increased versatility. Total dynamic head in feet based on clean, cold water and 1750 or 3600 rpm motor. The head capacity and efficiency curves apply only for liquids having a viscosity less than 40 SSU. 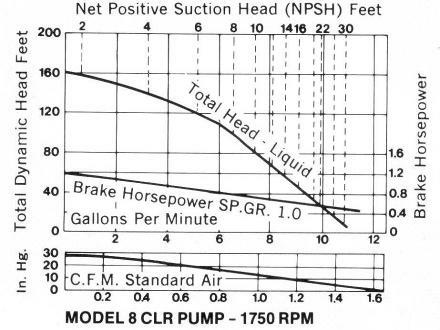 The brake horsepower (BHP) curves are based on a specific gravity of 1.00. 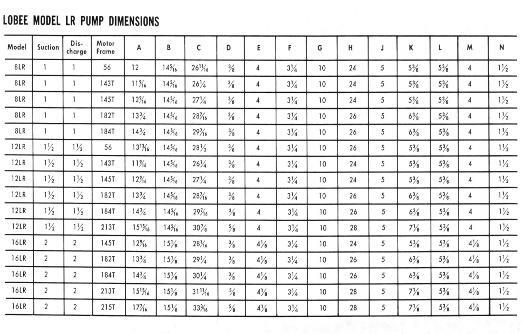 To determine the BHP for other liquids multiply these values by the specific gravity. NPSHR (Net Positive Suction Head Required) data for new CHLR Liquid Ring Pumps is forth coming as testing is in process. 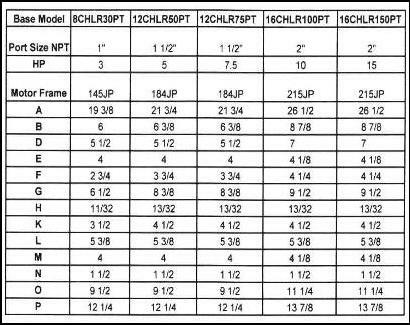 Based on a higher motor speed NPSHR will be slightly higher than published CLR numbers. For additional performance data please contact factory. The Lobee liquid ring pumps operate opposite how typical liquid rings pumps do… They do not compete with the volumetric output and efficiencies of dedicated air/gas liquid ring pumps. The Lobee LR pump handles a higher liquid flow and a minor air/gas flow against a negative pressure environment. 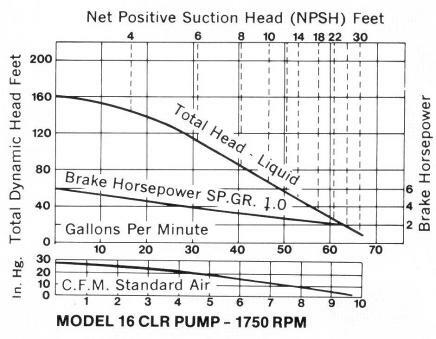 So, compared to other manufacturers which can flow a large volume of air/gas at various vacuum levels, our liquid ring pumps of comparable HP will pump only 15-20% air/gas volume in the same vacuum environment…but ours will pump 1,000% more lower viscosity liquids (40 SSU or less). Conventional liquid ring pumps deliver a higher ACFM air/gas with a minimal liquid flow capability, whereas the Lobee LR pumps deliver minimal air/gas with a higher fluid flow. Historically our pumps have been used to augment processes in which a stand alone vacuum pump cannot handle the amount of fluid that needs to be evacuated. So the dedicated vacuum pump evacuates the air/gas mass at what ever requirement and our liquid ring handles or evacuates the liquids. An example would be the plastics industry for this type of application.